Many factors can make an excavation estimate rise or fall. How remote a site is, how stable the soil, and how much tree or rock coverage needs to be removed, are all big considerations for construction companies. Excavation is a necessary and sometimes time-consuming step in any construction project. This service is considered sitework or site preparation, meaning that it’s not directly related to the actual building of the structure. Excavation is needed when earth has to be removed or modified to create a foundation, wall shaft, or trench during construction. This is when the ground has to be prepared to support the weight of the new structure. These costs can vary based on many factors, mostly concerning the ground itself. Pricing may also depend on where you live in the country and what type of climate you’re dealing with. Grading is essentially shaping and preparing the land to be used in a building project. This could consist of flattening the land to provide an even foundation or sloping a portion for adequate water run-off to help avoid water pooling up. The topsoil is first removed so that the soil underneath can be leveled and changed as needed. An excavation estimate will take into account what kind of shape the land is in to determine the grading that will be necessary. The soil in a construction area has to be tested to ensure it is stable and competent and can handle a building on top of it. This is a crucial part of the process, as unsteady soil may sink and cause extreme structural damage later on. There are laws related to soil treatment that builders need to be aware of during excavation. New Jersey law under the NJ Soil Erosion and Sediment Control Act requires that construction sites have to be greater than 5,000 square feet and developed with a plan to control erosion during and after the construction project. Such laws ensure that excessive water runoff from developing sites does not cause erosion, which can lead to greater problems for an area. The NJ Soil Erosion and Sediment Control Act outlines that soil erosion continues to be a problem for the state, and that construction and development sites have “accelerated the process of soil erosion and sediment deposition, resulting in pollution of the waters of the State and damage to domestic, agricultural, industrial, recreational, fish and wildlife, and other resource uses.” So, attention to these matters is important. One big factor that will determine excavation costs is whether there are a lot of trees in the area, or whether lots of rock will need to be removed. This part of the process is called land clearing, and the more that needs to be cleared away, the more time it will take – trees must be completely uprooted, not just cut down. These tasks can be laborious, increasing cost. If the site is in the middle of a city or near a major roadway, it could be trickier to manage the excavation. There could be underground wiring or similar issues to deal with when digging up the ground. This is another way that costs could rise or fall, depending on how remote the construction site is. The fees for excavation permits will vary by the type of project and location, since cities generally govern these permits individually. But a permit and fee will always be required, as builders aren’t just allowed to dig up a site at any time. Of course, costs will vary depending on the location’s climate. The average weather in an area will govern many of the aspects covered above, such as grading, since a lot of moisture often means a lot of change in leveling or sloping. Mikula Contracting provides both commercial and residential excavation services, ensuring that site preparation and earth moving are done the right away using the appropriate heavy equipment. 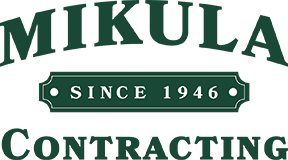 Learn more about Mikula Contracting’s residential excavation services.